Unlike the beautiful Ice Hotel outside of Quebec City, Montreal’s Snow Village is an icy escape that is reachable by public transportation! Located in the Parc Jean-Drapeau on St. Helen Island, the Snow Village is an Ice Hotel, bar, and restaurant that Montrealers can enjoy for a drink, or an overnight adventure. 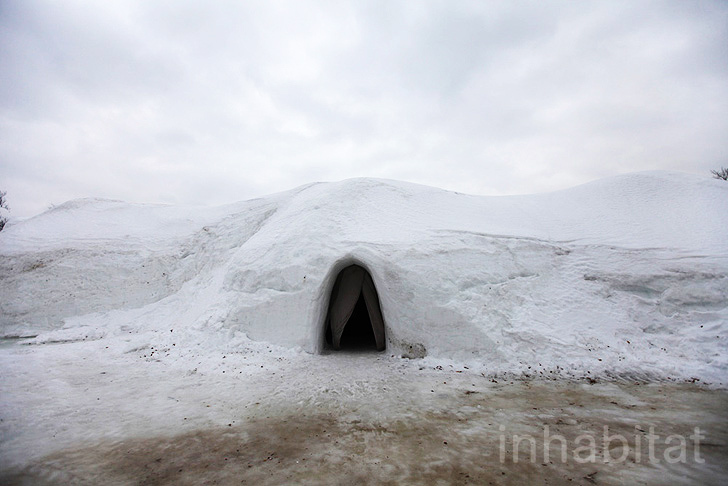 The Snow Village is part of the first ice hotel chain, which has famed original locations in Finland and Norway. Thanks to the friendly folks at the Tourism Board of Montreal, Inhabitat enjoyed a private tour of the village, as well as an incredible dining experience at the famed ice restaurant - read on for a look inside! A short walk from the subway station, the village stands next to the Biosphere Environmental Museum, and sits on the shoreline of the St. Lawrence River. The Ice Hotel offers fifteen standard guest rooms and ten prestige suites, as well as free-standing private guest igloos. Family rooms can accommodate up to six, and prestige suites just two. The themed suites also feature artisanally carved ice sculptures and furniture in a variety of themes – from the Stanley Cup suite to the Circus suite, which commemorates Montreal-based Cirque du Soleil. The Snow Village also hosts the Pommery Ice Restaurant, which serves a gourmet 3 course meal by famed Chef Eric Gonzalez. Guests sit on warm furs on ice seats, with wooden placemats that protecting their savory dishes from the ice table. The room is centered around a glowing LED lit ice Pommery bottle, with romantic tables radiating out from the center. The Amarula Ice Bar is a great place to pop in for a drink, dance to a rotating cast of DJs, or even to watch a game on one of the oversized LCD screens. Both the ice bar, and an adjacent meeting room are open for unique company happy hours or retreats. Each of the rooms in the Snow Village is a dome-like structure. Unlike the Hotel de Glace, which was constructed using steel braces as a mold, the Snow Village is made with the aid of a giant balloon. The round balloon is inflated, and ice is packed around it. Once the ice hardens and more snowy layers are built up, the balloon is popped, creating the round caverns inside. The village’s location on St. Helen’s Island provides gorgeous city views from within the magical crystalline structures. 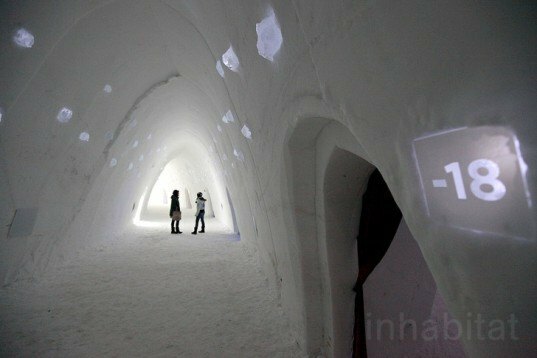 The Snow Village creates a unique opportunity for urban dwellers to explore the snowy grounds and icy structures – and it’s just a subway train away! Each of the rooms in the Snow Village is a dome-like structure. A short walk from the subway station, the village stands next to the Biosphere Environmental Museum, and sits on the shoreline of the St. Lawrence River. The Ice Hotel offers fifteen standard guest rooms and ten prestige suites, as well as free-standing private guest igloos. Family rooms can accommodate up to six, and prestige suites just two. The themed suites also feature artisinally carved ice sculptures and furniture in a variety of themes - from the Stanley Cup suite to the Circus suite, which commemorates Montreal-based Cirque du Soleil. The Snow Village also hosts the Pommery Ice Restaurant, which serves a gourmet 3 course meal by famed Chef Eric Gonzalez. Guests sit on warm furs on ice seats, with wooden placemats that protecting their savory dishes from the ice table. The room is centered around a glowing LED lit ice Pommery bottle, with romantic tables radiating out from the center. The Amarula Ice Bar is a great place to pop in for a drink, dance to a rotating cast of DJs, or even to watch a game on one of the oversized LCD screens. Both the ice bar, and an adjacent meeting room are open for unique company happy hours or retreats. Unlike the Hotel de Glace, which was constructed using steel braces as a mold, the Snow Village is made with the aid of a giant balloon. The round balloon is inflated, and snow and ice is packed around it. Once the ice hardens and more snowy layers are built up, the balloon is popped, creating the round caverns inside. The village’s location on St. Helen’s Island provides gorgeous city views from within the magical crystalline structures. The Snow Village creates a unique opportunity for urban dwellers to explore the snowy grounds and icy structures - and it's just a subway train away!